Who needs to aim when you can just hit everything? Some effects, rather than having a single target, affect everything within a given area. This area is the "area of effect", and attacks/buffs that work this way are called area of effect attacks/buffs. Popular in Tabletop Games and Strategy Games, area of effect attacks are very useful for taking out large numbers of weak enemies simultaneously. However, they'll usually avert Friendly Fireproof, adding another layer of strategy to their use. They aren't necessarily offensive in nature, either — healing or protection abilities often work in an area of effect as well. Super Trope to Splash Damage, but while splash damage falls off the farther away you get from the center of the attack, area of effect attacks affect everything in its area equally. Supertrope to Herd-Hitting Attack. See also Splash Damage Abuse, when an Area Of Effect is abused to get enhanced performance out of the ability. If the "effect" within the area of effect is "instant, horrible death," then you're looking at an attack with an "Instant Death" Radius. For more permanent areas of effect, see Place of Power, Field Power Effect and Geo Effects. In Bleach, this tends to be the go-to technique for dealing with an opponent who can use illusions or mess up sensory information. After all, it doesn't matter if they can disguise where they are if the character can just hit everywhere at once. Area-of-Effect is a distinct subcategory of Attack magic in the Lyrical Nanoha universe. It mainly consists of elemental spells that freeze/burn/etc. everything within a certain radius and massive shooting spells that produce so many projectiles, they are impossible to dodge. In Kill la Kill, this is how Ryuuko defeats Inumuta in Episode 10. Can't see your enemy due to his optical camoflauge? Why, attack the entire arena at once! Discussed in The Dresden Files short story "Day Off", where Harry complains about the arbitrary diameter of a fireball spell while gaming with the Alphas. Dungeons & Dragons is the Trope Maker, having included areas of effect (typically in the form of dragons' breath and certain magic spells) since its very first edition. Champions has Area Of Effect as a Power Advantage. It's used to turn regular single target attacks into this. In the Star Fleet Battles Tabletop Game, the ISC's Plasmatic Pulsar Device divides its damage over several shield sections, affecting each equally. These are ubiquitous in wargames, where area of effect determines what pieces are hit by artillery shells, spells, and similar attacks. Sometimes, the distance from a certain point on the table is measured instead to see if something is affected. Warhammer and Warhammer 40,000 have several round plastic templates and two "flame blast" templates (dragon breath, flamethrowers, "napalm," etc). Flames Of War uses a similar plastic piece for representing bombardment. Paranoia sees fit to warn about these in the "Tips for Traitors" section: "Never let the guy with the area-of-effect weapon take far left or right flank. The temptation to turn and wipe out the rest of the team in one go is just too much." Big Eyes, Small Mouth has "area" as a standard variable to enhance the effects of attributes. In most cases this goes hand-in-hand with the "target" variable to identify how many individuals within the area that an attribute can affect at one time. However, the "Weapon" attribute (which covers all forms of attack) automatically affects everything in range to begin with. Instead, for the low, low cost of 1 character point, the "selective" variable lets the user choose who is and isn't harmed when using the weapon. Since Final Fantasy II, most spells can be set to target either all enemies or all allies. Final Fantasy I instead had a large amount of offensive spells and upgraded support spells hit all enemies by default. Final Fantasy VII and Final Fantasy IX Take this up a notch and introduce what's known as "Mega attacks". These can only be performed by the antagonist. In VII, Sephiroth rises into the air and the screen shatters. Taking Cloud and team on a Solar System attack of epic proportions. Ending in a big Super Nova. In IX The ring around Necron's waist spins fast. Those that don't have an adequate amount of supportive abilities will be either in Zombie, Petrified or knocked out. And if the whole party is affected, it's pretty much a Game Over. This' averted with Cloud and team With Cloud's 4th Limit Break, gained by winning it at the Gold Saucer. 32,000 BP/64,000 BP). He assaults all enemies, the summons are usually this with screen filling attacks. In Final Fantasy Tactics (and sequels), there are several different effective ranges. Final Fantasy XIV Loves this trope to bits. Enemies and bosses alike have a wide range of attacks that have varying degrees of AOE's. The maximum is what is called room-filling AOE which is mostly exclusive to bosses. An attack that usually halves the party's HP. In Granblue Fantasy, some characters are able to hit all three enemies on the right side of the screen for every attack, the in-game descriptions label them as "all-foe attacks". Also many of the spells in the Grandia games. Hoshigami Ruining Blue Earth: You could even increase the area of effect of your spells by crafting the Coinfeigms together. Mages in Dragon Age: Origins have access to massive AOE spells, which are pretty much a necessity late in the game, when crowd control becomes essential. In Nippon Ichi tile-based Turn-Based Strategy games, the more you level up your spells, the larger and more complex the area of effects you can access are. Flamethrowers in Valkyria Chronicles and Valkyria Chronicles II hit everything in a large conical shape in front of the unit, ignoring cover. Grenades in Resonance of Fate do the same amount of damage to anything within the blast radius rather than using Splash Damage. Many hero spells in Warcraft III are this. Some are "friendly fire" spells that hurt friend and foe alike (such as the Archmage's blizzard, Blood Mage's Flame Strike, and Pit Lord's Rain of Fire) and some are enemy-only targeted (such as the POTM's Starfall) or ally-only (Keeper of the Grove's Ultimate). 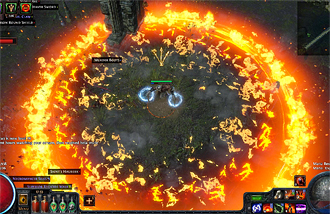 Diablo and Diablo II feature lots of spells and effects with a circular hit radius, like Nova and its counterparts of other elements (including Diablo's Fire Nova), the Sorceress's Static Field (drops every nearby enemy's HP by a direct percentage), the Necromancer's Corpse Explosion and curses, the Barbarian's Warcries (both the buffing and de-buffing ones), and the Paladin's auras. The X-Universe games has the Phased Shockwave Generator, an area of effect weapon that damages ships based on how many "squares" of splash damage touch the ship. What this essentially means is that capital ships will take absurd amounts of damage because they're so huge. Terran Conflict introduced the Plasma Burst Generator, which is basically a space flamethrower that shoots fusion exhaust at the enemies, dealing AOE damage. It works pretty much like the Shockwave Generator, but it is more focused (Shockwave Generators spread out at about 70 degrees, whereas Plasma Generators spread only 5-10 degrees), and mounted on smaller ships. MAP attacks in the Super Robot Wars hit all tiles in the targeted area, most commonly a (near) circle around the user, though other patterns appear from time to time. Some are Friendly Fireproof, most are not. While Pokémon started out with strictly one-on-one duels, latter games added Double and Triple Battles and introduced area-effect moves (or changed existing moves to be such, such as Earthquake and Explosion) of pretty much every kind imaginable. Avencast: Rise of the Mage only has a handful of such moves across the two skill trees, but they're indispensable in large-scale fights and vexing when used against you. Molotov cocktails in Yo! Joe! Beat the Ghosts create pools of burning liquid which damage every enemy in their range. This is especially useful against bosses. Throughout The Elder Scrolls series, spells are available with an area of effect in addition to the single-target variety. Typically, these area of effect spells cost more Magicka to cast than single-target spells of the same type and level of damage. Many powerful magical enemy types like to spam these sorts of spells, including lesser Daedra, Liches, and Hagravens. Some of these spells also cross over with Splash Damage, as a target hit directly takes more damage than those around him in the area of effect. All spell types in Nexus War games have variants or modifications to target everyone in the room who isn't somehow immune. These edged into Game-Breaker territory in the original game, in which factions prepared some of their spellcasters to be deployable nukes, and has been considerably toned down in the current iteration of the game. Cosmic Star Heroine features several abilities that deal damage to both the target and any allies within a certain radius. Since both the player party and enemies take arbitrary positions which they don't change for the entire battle, these skills tend to be very situational. Blossom Tales: The Sleeping King has several attacks that deal damage to any enemy within a certain distance of the heroine: the basic Spin Attack, the Quake Spell, the Fire Spell, and the Thunder Spell. Yo Kai Watch Blasters works in the same way as Online role playing games, namely with Final Fantasy XIV.